A space cushion is certain amount of distance you keep between you and the car in front of you that allows you to easily maneuver in any condition. A typical space cushion in perfect conditions would be about 3 seconds between you and the car in front of you. Make sure there is at least a 3-second space cushion between you and the car in front of you. 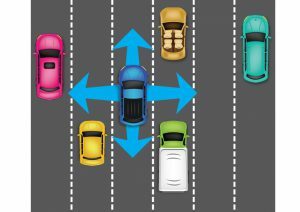 For less than perfect weather conditions, keep a 4 – 5 second space cushion between you and the car in front of you. If another driver cuts in front of you into your space cushion, just ease your foot off the gas pedal and slow down until you once again have a safe distance between you and the other car. One way to make freeway driving safer is to keep what some call a space cushion around your car. Let’s review how to maintain a space cushion. If all conditions are perfect, keep three seconds between you and the vehicle ahead of you. When the car or truck ahead of you passes a certain point, Count three seconds. If you finish counting before you get to the point you selected that means you have an appropriate amount of space between your car and the one ahead. If you pass the point before counting to three then that would mean you were following too close and would have to back off a bit. Add one additional second for any condition that is less than perfect. That can include heavy traffic, not feeling well, or other distractions. Add two additional seconds to your space cushion if it is raining or snowing. Rain and snow reduce both visibility and traction. If another driver cuts in front of you into your space cushion, just ease your foot off the gas pedal and slow down until you once again have a safe distance between you and the other car. So whether you’re on a freeway in downtown traffic or out in the country, the key is to be alert so you can adapt to whatever unique circumstances you might be driving in.